Dirt and smudges can easily ruin the delicate optics and mechanisms of a modern digital camera. 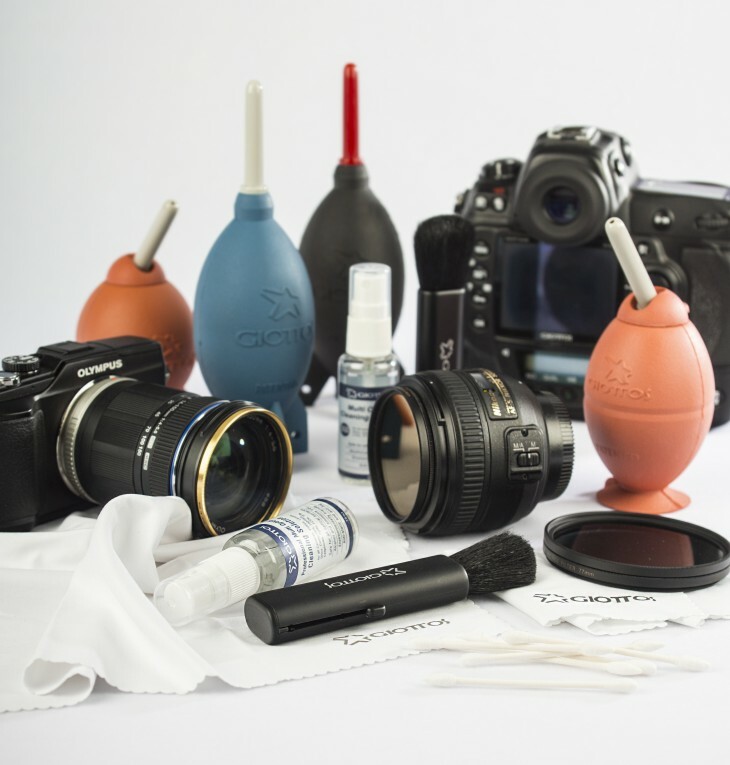 It’s important to have a reliable cleaning kit to keep your digital camera functioning at top performance. 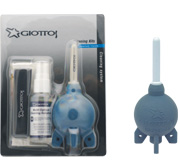 Giotto’s cleaning kits use natural and environmentally-friendly material, include air blowers, multi optical cleaning solution, micro-fiber magic cloth, retractable brush and cotton swabs in different packing. Suitable for cleaning camera, lens and precision optical equipment, also useful on musical instruments, computers and communication equipment. All the air blowers are made from natural and environmentally friendly rubber. The super air stream blows off dust particles, even those attracted by static electricity. 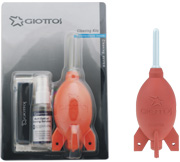 Giotto’s patented and unique base design allows to stand by itself and prevents accidental blocking of the inlet valve as well as making it easy to store. The inlet valve prevents back flow from the air tube. 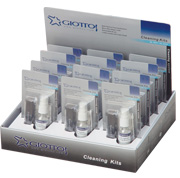 Quick and efficient cleaning for grease, fingerprints, dust, smudge marks, etc. It’s super soft and safe for optical surfaces,no sticking fibers after use. Use either wet or dry; same performance after washing. Excellent performance on camera lenses leaving no streaks as well as for AV devices, cell phone screens, discs, glasses, computer screens, jewel, etc. 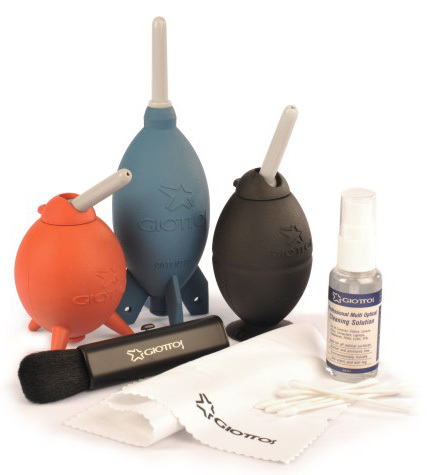 Made from soft goat’s hair, ideal for cleaning digital cameras,lenses, viewfinders, LCD screens and keyboards. Also suitable for cleaning analog cameras, telescopes, binoculars, etc. 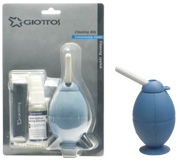 Made from 100% cotton with a blunt end and a pointed end for cleaning corners. 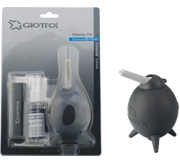 Perfect for cleaning optical equipment, especially camera and video finders. Any dirt or dust remaining in the corners is easily removed. 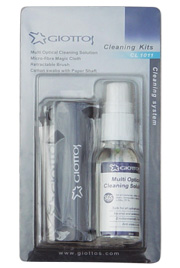 This multipurpose cleaning solution is suitable for use on all cameras, DV, lens, DISC, computer, mobile, PDA glasses and for all LCD screens. PH 6.5 medical grade ingredients, quick and efficient cleaning of grease, fingerprints, dust, smudge marks, etc. and safe for optical surfaces. for keeping as well aseye-catching display.